Learning about crop wild relatives | A balanced diet . . .
Much of my work with plant genetic resources has concerned the conservation and use of landrace varieties, of potatoes and rice. Yes, I have done some work with wild species, and helped occasionally with collection of wild species germplasm. In terms of research, I managed an active group of scientists at IRRI in the Philippines working on the biosystematics of rice (mainly AA genome species relationships). I also had undergraduate and postgraduate students work on the wild species of Lathyrus and potatoes during the years I taught at The University of Birmingham. I made just one short collecting trip with Jack Hawkes in early 1975, into the Andes of Central Peru to find wild potatoes. That was a fascinating trip. He knew his potato ecology; he could almost smell them. 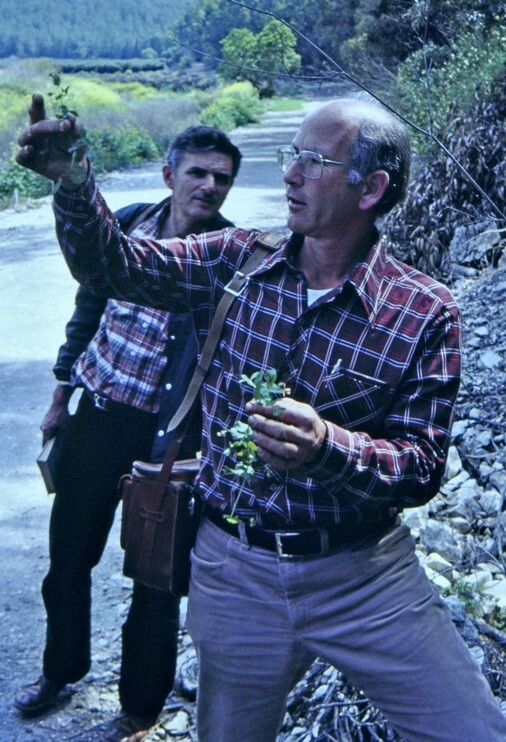 On returning to the UK in 1981, I joined my colleague Brian Ford-Lloyd to collect wild beets in the Canary Islands, and some years later assisted one of my PhD students, Javier Francisco-Ortega, to collect seeds of a forage legume in Tenerife. I wrote about these two collecting trips recently. I also helped to collect some wild rices during a visit to Costa Rica in the late 1990s but, in the main, orchestrated a major germplasm collecting program while leaving the actual collecting to my other colleagues in IRRI’s Genetic Resources Center. One of my teaching assignments at Birmingham was a 10-week module, two or three classes a week plus plus an afternoon practical, on crop diversity and evolution. Many of the world’s most important crops such as wheat and barley, and a plethora of legume species such as lentil, chickpea, and faba bean originated in the so-called Fertile Crescent of the Middle East. Apart from a couple of short trips to western Turkey, I had limited experience of Mediterranean environments where these crops were domesticated. I’ve since been in Syria a couple of times in the 1990s. 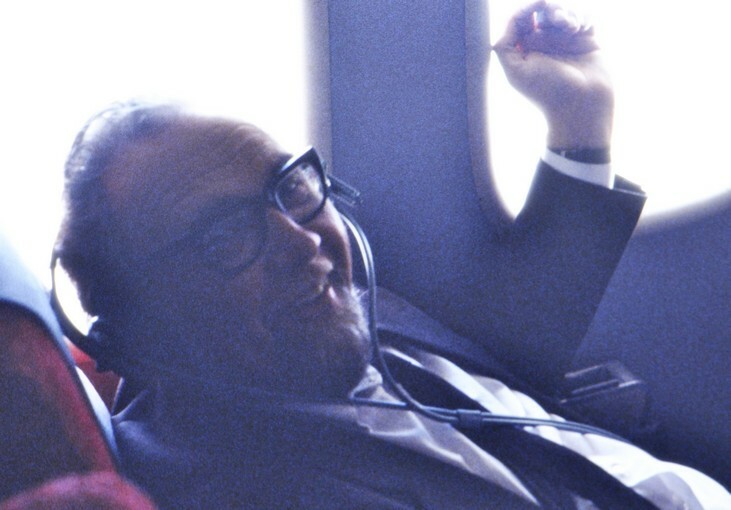 That was all rectified in at the end March-early April 1982¹ when I had the good fortune to participate in a course—two weeks long if my memory serves me well—in Israel, organized by Profs. 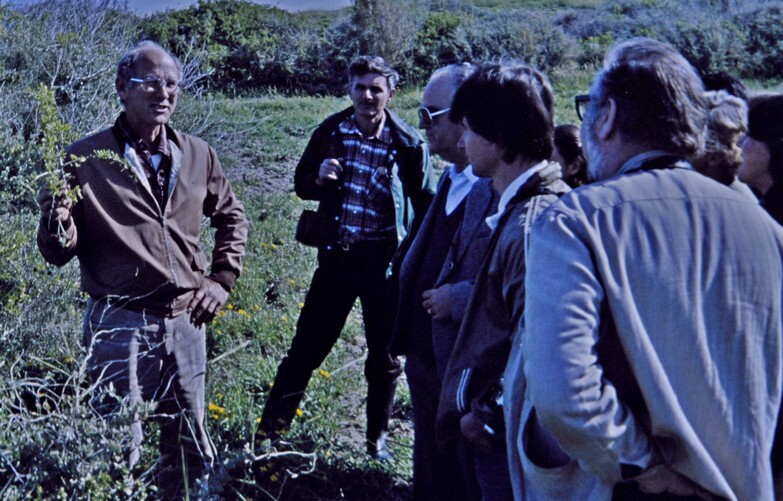 Gideon Ladizinsky and Amos Dinoor of the Hebrew University of Jerusalem, at the Rehovot campus near Tel Aviv. Gideon Ladizinsky explains the ecology of wild lentils (or is that wild chickpea?) while Amos Dinoor looks on. I recall that the course was funded (or at least supported in part) by the International Board for Plant Genetic Resources (IBPGR). Among the other participants were several MSc students, class of 1981-82, from The University of Birmingham attending the Conservation and Utilization of Plant Genetic Resources course in the Department of Plant Biology. Not all the students of that intake could take up the invitation to travel to Israel. Those from Bangladesh, Malaysia, and Indonesia for example were not permitted (under their national laws) to visit Israel, even though an invitation had been extended to all students regardless of nationality, and the Israeli authorities would have issued visas without a stamp in their passports. I don’t remeber all the other participants. We must have been half a dozen or so from Birmingham, plus Bruce Tyler from the Welsh Plant Breeding Station (now part of the Institute of Biological, Environmental and Rural Sciences, IBERS, at Aberystwyth University), George Ayad from IBPGR, Zofia Bulinska-Radomska and one of her colleagues from the National Centre for Plant Genetic Resources, IHAR, near Warsaw, Poland, Luis Gusmão from Portugal (who attended a short course at Birmingham), and others whose names I cannot remember. Standing, L-R: Zofia Bulinska-Radomska (Poland), Mike Jackson, ??, ? ?, ??, ? ?, George Ayad (Egypt, IBPGR), Rainer Freund (Germany), Bruce Tyler (WPBS), Amos Dinoor, ? ?, Luis Gusmao (Portugal). Front row, L-R: Krystina ?, ? ?, Brazilian MSc student, Gideon Ladizinsky, Ayfer Tan (Turkey), Margarida Texeira (Portugal). We stayed at a kibbutz near to Rehovot, and were quite comfortable there. It was a short drive each day into the campus for the classroom activities, some lectures and practical classes. But we also made excursions from the north to the south of the country, and east to the Dead Sea to find crop wild relatives in their native habitats. I wonder, 35 years on, how many of those habitats exist. We travelled freely between Israel and parts of what are now the Palestine Authority controlled West Bank. In northern Israel, close to the Sea of Galilee. In the Elah Valley, where ‘David slew Goliath’. We had opportunity of seeing these wild relatives in what was essentially a living laboratory. 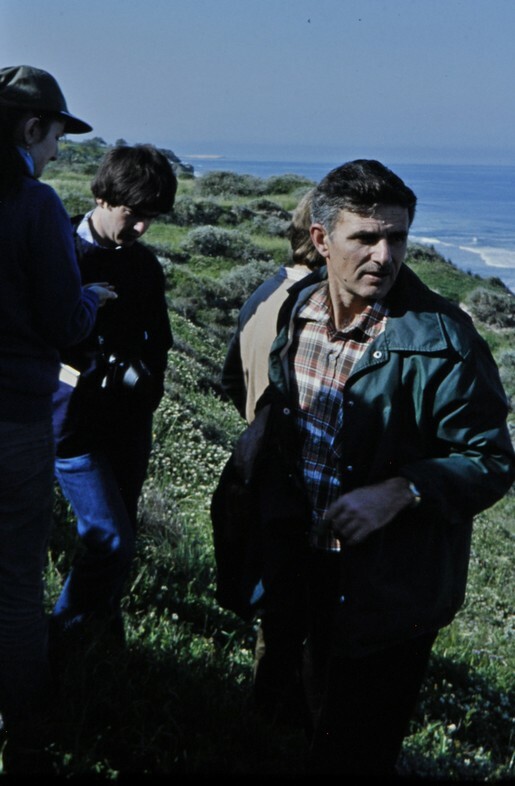 Both Gideon and Amos, experts in their fields of crop diversity and domestication, and disease epidemiology in wild species, respectively, used many of these wild populations for their research and of their students. My eyes were opened to the important role of ecology in these seasonally dry-wet landscapes, often on limestone, and the differences to be found between north- and south-facing slopes. I unfortunately no longer have some of the photos I took during that trip of the populations of wild barley, Hordeum spontaneum, that grew over large swathes of the landscape, looking to all intents and purposes like a field of cultivated barley. It was in populations like these, and of wild oats that Amos Dinoor studied the dynamics of disease spread and resistance. Gideon had a wonderful way of linking species in different habitats, how they maintained they biological identity, often through flowering at different times of the day. I remember on one occasion as we walked through a mixture of oat species with different chromosome numbers, or ploidy. I asked Gideon the time, but he didn’t look at his watch. Instead, he picked a panicle of one of the oats alongside the path, and replied ‘It’s about 4:15 pm’. Then he looked at his watch. It was almost 4:15 pm! He was so familiar with the ecology of these species that, under defined conditions, he could predict when different species would flower. Remarkable! On the coast, south of Tel Aviv, we did look at disease in different wild species. I certainly learned a great deal from this course, and discussing crop evolution and domestication with these experts from the Fertile Crescent, and others like Daniel Zohary (who had published on the origin of lentils about the same time as me in the mid-1970s; he passed away in December 2016). Among the young scientists we met was Dani Zamir who pioneered the use of enzymes, or isozymes,to study the diversity of crops and their wild relatives, tomatoes in his case. There was one interesting episode during the course. When teaching crop evolution to my Birmingham students, I encouraged them to analyse the evidence presented to account for the origin and evolution of different crop species, often based on conflicting hypotheses. So, it was natural for them to ask questions at the end of each lecture, and even question the interpretations they had heard. After just one or two sessions, and much to the consternation of my students, the ‘professors’ refused to take any questions. As I explained to my group, their hosts had worked on a range of species in depth, and were convinced that their interpretations were the correct (and only?) ones to be believed. My students hadn’t been impolite or ‘aggressive’ in their questioning, just keen to explore more ideas. 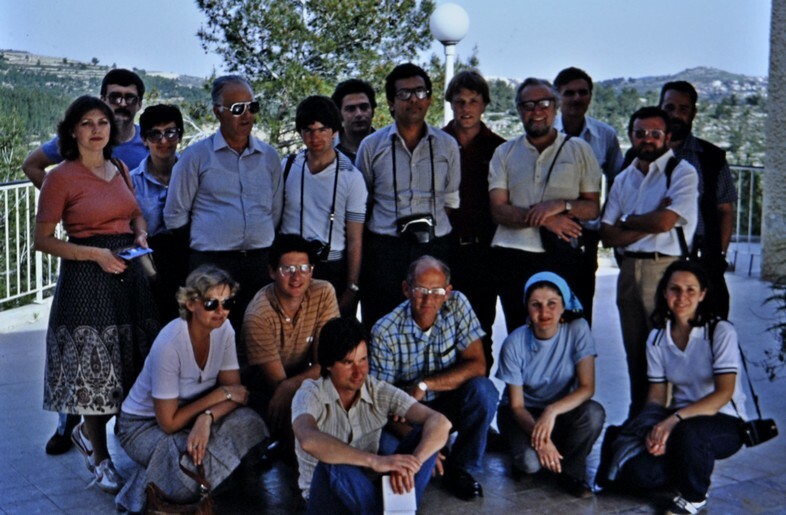 We did also have opportunities for sight-seeing, around Jerusalem and to the Dead Sea, as well as understand some more about irrigation agriculture for which Israeli scientists and engineers had become renowned. ¹ I remember the dates quite well, as they coincided with the invasion of the Falkland Islands in the South Atlantic by Argentina, and the course group had many discussions in the bar at night what the reaction of Margaret Thatcher’s government would be. This entry was posted in Birmingham, Musings from the past, People, Science and tagged Birmingham, Botany, Dinoor, genetic resources, germplasm conservation, Hebrew University of Jerusalem, Israel, Ladizinsky, MSc course CUPGR, University of Birmingham.